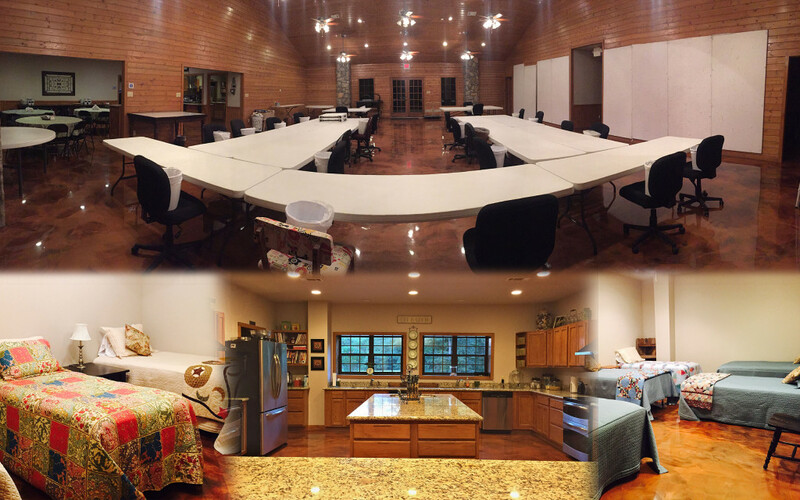 Stone Creek Lodge was originally built specifically and especially for quilters and crafters. For that reason, we believe that our facility will meet all your needs and then some! The great room in the Lodge is approximately 2000 sq. ft. The sewing/craf room has 6 double electrical outlets in the floor wired for all your needs. It’s well lit with both artificial and natural lighting and has 12 ceiling fans. We have 13 (8 ft.) tables, 3 (6 ft.) tables, 14 round tables, 2 (4 ft.) adjustable tables and 24 rolling office chairs. We provide power strips and extension cords (if needed). trash cans, cutting boards, iron boards, irons and design boards. We do not provide starch, glue, tape, etc. We also offer a lounging area, separate from the great room, with two sofas and a 42″ flat screen TV – HD “Dish Network” programming and BluRay/DVD player. We have sleeping accommodations for twenty-four (24) guests situated in six (6) bedrooms. All the bedrooms have night stands, lamps, bedside rugs (on request) and garment hooks. Bath and bed linens are provided by the Lodge. We have three (3) restrooms equipped with four (4) large showers, five (5) water closets and five (5) vanity sinks. Next to the showers are garment hooks and a bench. We have a spacious dining room and kitchen. The kitchen has four ovens, four dishwashers, two trash compactors, two side by side refrigerator/freezers, five sinks and two microwaves. We also have an ice machine and coffee maker. We now have HughesNet. You will be able to check your email and social media, but we must ask that you do not watch videos, livestream movies or television. If you ahve any questions regarding internet use, we can answer those upon arrival. There is a lovely patio off the rear of the building with a view of the trees and a pond. It’s equipped with patio furniture and a bar. Smoking is not allowed in the building.